Description: Condor Outdoor Products Inc. has over 20 years of experience in the tactical/outdoor gear industry; specializing in tactical gear including vests, plate carriers, modular pouches, and packs. They are a licensed Multicam and A-TACS dealer. Condor Outdoor gear has become a staple in law enforcement, military, and airsoft industries given its quality and affordable price. More recently they have expanded to making more of their products in the USA and have added a tactical apparel line, offering technical performance jackets, base layers, and pants. This holster will fit virtually any handgun. The system wraps around the pistol creating the perfect fit and tensioned to the users specifications. Rubberized leg straps prevent slipping. 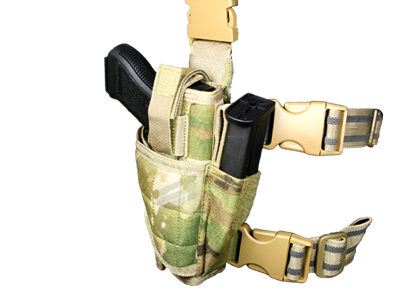 Integrated Mag pouch includes an adjustable strap to secure a pistol mag, Tac-light or knife. i have heard the on one specific pistol (mk 23) the holster hits mag release, but i do not have problem so not a con for me. I Do NOT recommend this Holster. After using it for months, I finally bought a new one. I'm the kind of player that plays in a fast paced mode, meaning I will be taking out my pistol and in the next second i'll be putting it back and running somewhere. This holster makes me have to stop for 10 seconds to close the "Straps" that keep the pistol in there. If i run without them fully closed, the pistol will fall, as they have fallen from it hundreds of times while I was running. - Takes forever to tighten up the straps in which hold the gun in, making you waste your time in the field. can this be used for both left and right handed users?